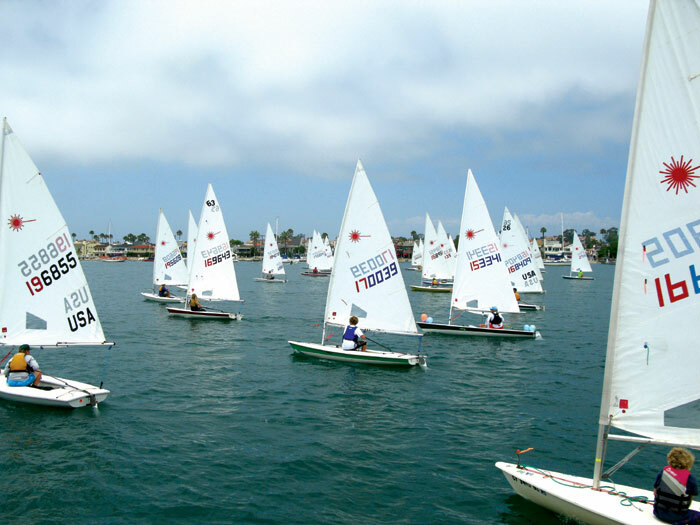 NEWPORT BEACH – Forty-three sailors participated in the 77th annual Flight of the Lasers regatta July 22, a Newport Harbor tradition that draws hundreds of spectators each year. The race started at 1 p.m. in front of the Balboa Pavilion, and sailors young and old competed in one-design Lasers — with some working toward a strong finish while others worked on their costumes. Beek noted that, as usual, some of the less-serious racers headed out on the course in full costume or with a decorated boat, making the event a festive occasion for all involved. The 77th Flight of the Lasers was hosted by the Commodores Club of the Newport Beach Chamber of Commerce. 1st: Adam Deermount; 2nd: Christophe Killian; 3rd: Philip Thompson; 4th: Jamie Malm; 5th: Nick Madigan; 6th: Alan Andrews; 7th: Gator Cook; 8th: Ross Nemeroff; 9th: Tim Richley; 10th: Steve Rados. Youngest Boy: Daniel Lockhart (age 11), 17th. Youngest Girl: Kate Madigan (14), 12th. Oldest Skipper: Dave Tingler (79), 22nd. First Girl: Kate Madigan, 12th. First Parent/Child: Brett and Will Hemphill, 11th. First Married Couple: David and Mary Lamontagne, 19th. Best Decorated: Blake Cianciarulo, Karafaye Buffa. Best Costumes: Aaron Raff, Matt Ctvrtlik.